I had the unique opportunity to have an interview with Left-Handed Pitcher Andrew Perez from Orlando, Florida. Perez had an incredible career with the USF Bulls as their primary closer and was selected in 2018 MLB Draft by the White Sox in the eighth round! Q: At what point in your life did you decide baseball was the ideal path for you? Was your family a driving force in your success in baseball? A: I would say definitely starting my junior year when I committed to USF and playing with FTB ( Florida Travel Ball Organization) that I can say baseball is going to be the path for me. As well as my freshman year of college playing in the Northwoods League in which it was a very competitive league and closest experience to professional baseball. My family was a very important driving force in my baseball career. From 8th grade on, they have been an incredible factor not only on the field but off the field as well and I could not thank them enough for all that they do. Q: In 2017, you were the Bulls’ top closer out of the bullpen with 52 K’s, 39.2 innings pitched, and a 2.34 ERA. Besides your substantial skill as a pitcher, is there a significant level of stress as a closer, or is it more hyped up by spectators? A: I think the stress becomes more self stress. Obviously as a closer your mentality is completely different to that of a starter. You have to be quick triggered, ready to go each day, as well as flush your outing from prior regardless of how well or poor it was. It too at times can be hyped very much by spectators in example, games against ranked opponents or rivalry games bring a little more juice. Q: Have you been to Chicago before? If so, what’s your favorite part of the city? A: I have never been to Chicago but I have lived through my girlfriend who was there during spring break and she was rubbing it in my face with how amazing the weather was meanwhile I was dealing with the heat and humidity in Florida! So glad for me I will be able to have a tour guide when I get to Chicago since she has family there. Even though she is a cubs fan I have made her a White Sox fan! Q: Was it always your goal to play in the MLB? What can you expect in your career as a future member of the White Sox? A: I had the goal of playing in the MLB as college went on. There were some professional interest out of high school but it definitely grew in college. Playing in the marching band (a drummer in drum line) I could say my career path was always a little bit less straight than others. 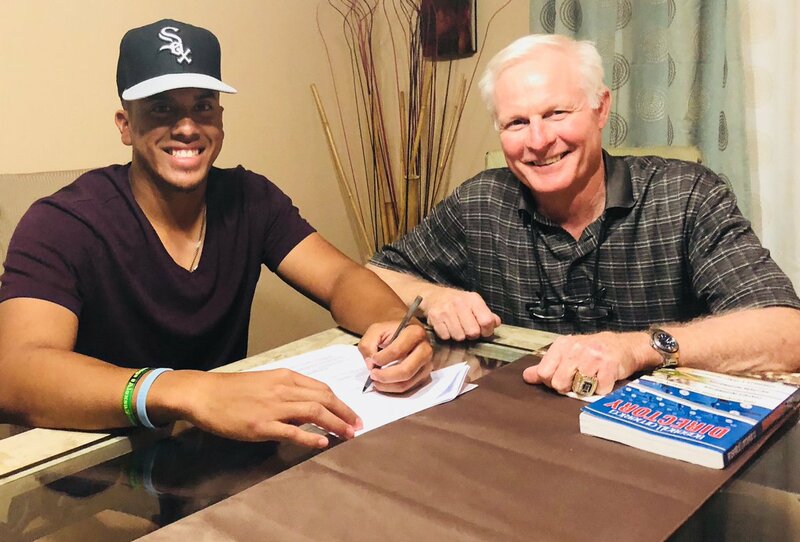 Now with the opportunity at hand, I was beyond blessed to be selected by the White Sox and I know this is a very elite opportunity that I have been able to achieve. With that being said I will continue to work hard both on the field and off the field in being a special person that can be a representation of what it is to be a White Sox player. Q: Are there any advantages as a Southpaw that you’ve noticed in your career at Timber Creek High School and USF? A: Being a left-handed pitcher has helped obviously with the recruiting trail. Once I got more velocity (up to 96) and developed more command and off-speed offerings it made it much easier to develop as a southpaw. There is a quicker development for left-handed pitchers and the need is much higher as you move up in college or professional baseball. Q: Have you had any contact with any other MLB teams outside of the White Sox? A: I had meetings with plenty of the MLB clubs but in the end of the day you can talk to all 30 but only one can select you! I was very thankful that it was the Chicago White Sox! Perez concluded our interview by thanking Coach Mohl and the USF Coaches, as well as, Coach Roberts and Coach Ryan; His strength and conditioning coaches!